i have heard of this, quote, secret, unquote, trail -- though i actually prefer the word preferential -- long before i joined AMCI, and i was most intrigued by it, so much that i hoped it would be my first climb after the BMC training. the opportunity, however, came only recently, owing to GMA’s holiday economics which moved the bonifacio day to the 28th instead of the 30th. 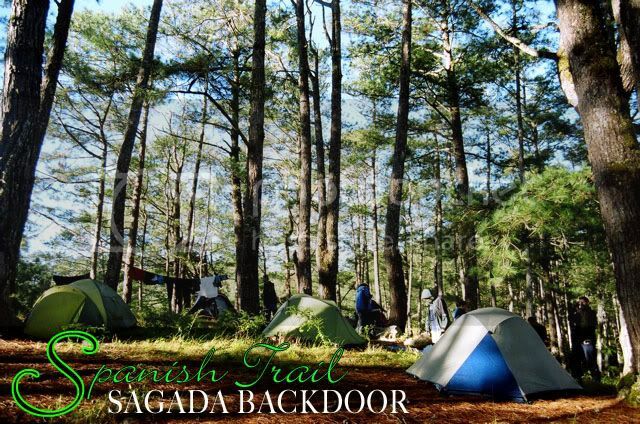 so with no IT and a sketchy idea of where we’d actually start trek, and how long we’d be walking each waking day, i signed up for sir oca’s old spanish trail, also known as sagada backdoor. our designated TL maida, following tradition and a more or less specific instruction, kept the climb schedule under wraps. it was a climb of faith, so to speak, trusting an idea mired in both mystery and confidentiality. i was only too happy to have been trusted with the “secret”. so last friday, we made for baguio city. the trip was thankfully short and without incident. i sat beside sigz and we spoke at length about many things, slept soundly for the next few hours, and woke up to discover that outside the already chilling bus, it was much colder. we then proceeded to chow king, as has been the habit each time baguio is made a jump off for other northern destinations. we then took an early hike to the bus station that would send us to the trail head. there was some debate, initially, whether it was nearby, or far enough to require a cab ride, when sir oca mentioned that it was a short walk. immediately after we started walking with our burdens towering high above our backs, we see sir oca inside a cab, speeding to the bus station. nevertheless, we were there by half past 5am. i imagined we’d be leaving in half an hour, but some prolonged discussions amongst the bus operators -- which nearly lead to a bloody clash of fists -- delayed us by as much as an hour. niel and i talked away the boredom, and i never really realized until then that he spoke with such a loud voice. i think we disturbed many of our companions who were eager to catch up on some sleep in the bus. eventually, the bus left halsema, and we were proceeding to a place that was unfamiliar to me, although the terrain pretty much resembles everything else you see in this mountainous region: houses walled by galvanized iron sheets, bad roads, pine trees, and shoulders of mountains all around. our jump-off was the municipal hall where we also had our lunch. from there you immediately get a feel of what to expect the next few hours: a trail that gently rises in elevation, slowly revealing landscapes that might appear only in a dream. the view is unchanging, but the greater the effort that is exerted, the better the seemingly static vista becomes. the closer we get to heaven, and the sights transform into something that draws your breath and dismisses the doubts the small challenge the trek presents. i say small challenge not because i underestimate the difficulty of the trek, but only because this was so much unlike the training climbs that culminated in the induction climb we’ve had in the past few months. there was actually an opportunity to, as the happy group put it, “smell and stop the flowers.” and there were quite a lot of flowers all throughout the trail: wild and smaller cousins of sunflowers, blooming in small yellow surprises along the monotonously green spanish trail. i was following kuya mar for most of the way, and i asked him how they chanced upon this trail. he provided me the protracted version of the story: that long before the advent of roads and highways, there were already foot trails connecting the towns around the mountains. 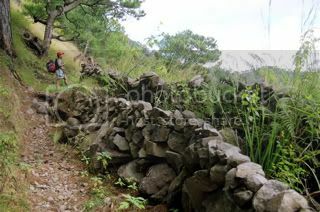 and they heard of one such trail leading to sagada. after a few tries, they finally discovered that it was possible to do the trail overnight. end of story. we were hoping to accomplish the same, and retrace the steps our northern brothers and sisters took during the spanish period, before roads were paved. niel, of course, confused his history as well as his geography and thought we were on our way to tirad pass. we took our first rest at the starbucks, so called because it was a wide expanse where they once had coffee. so much for the coffee, however, because a malfunctioning pot grabber spilled most of it to the ground. from there, our next stop was a small mound with a nice view. we reached the area ahead of everyone else because francis took a wrong turn somewhere. shorter, it turned out, but a bit more challenging. from there, we found ourselves surrounded by the forest. it wasn’t possible to tell where we were since everywhere, there was nothing but the erect trunks of pine trees. it was a most pleasant experience, because there was hardly any sign of human activity. the forest was ours alone. the ground was covered by a carpet of browned pine needles, and the clear, blue sky was winking above the wispy leaves of the towering pine trees. at around 4pm, kuya mar announced that we were near the camp, and not far from where we were was the view deck. we dropped our bags and immediately ran to oca’s rock. the view wasn’t as fantastic as i imagined, since the weather didn’t quite cooperate. the sky beyond the ranges was dreary, and the terraces below were brown and barren. later, the others who had fallen behind came one after the other, and although we had started returning to the spot where we left our bags, we had to climb back the viewpoint. 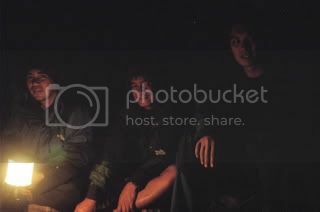 once back at the spot, kuya mar suggested that we set up camp in the flat area nearby. this was new, since the usual campsite was still a bit farther down the trail. nevertheless, it was a nice spot, with rocks that could double as chairs, and with a generous amount of flat areas to accommodate our tents. i pitched my tent all by my lonesome since my tentmate had decided to back out at the last minute. i thought i’d be spending the night alone inside, but i opened an invitation to anyone willing to share bedspace. angel agreed, and she placed her stuff inside just as we were preparing an early dinner. there were many hands to help, so dinner was a cinch. i basically just gave instructions, and pretty soon, we had my thai garlic pork, a rich plate of buttered mixed veggies, and fruit salad ready to be served. people loved the thai garlic pork dish, although i couldn’t quite claim credit for it since all i did was follow instructions on a packet. our after dinner socials consisted of an affair with gilbey’s. we opened a 1.5 liter kathmandu and settled around a dap-ay which we opened to women. what really surprised me that night was the fact that laarnie can actually outdo most of us in a gin-drinking contest. she is resilient to its offensive, burning flavor. i turned out cheating that night, giving higher shots to everyone save for myself. when we had downed the liter-and-a-half, the GSM blue was opened, but no one was interested in finishing it. dado said it tasted like battery fluid. finally, after a session with vince, i turned in for the evening. i planned to watch the sunrise at the viewdeck, and set my alarm at 5am. but when i went out, i discovered the spook that surrounded the campsite. it was dark, and the air was wet. 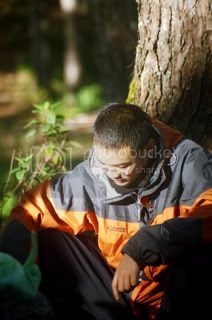 pine needles fell on my tent continuously and it felt like little fingers were tapping on it. although my petzl myo xp illumined the area with a brightness i’ve never before encountered in a campsite, the darkness swallowed my resolve to go on a 20 minute walk up the viewdeck. besides, i thought, the clouds might not allow for a nice sunrise. so i went back inside my tent and slept for a few more minutes. at 6am, with the sun up, i decided to sneak out of the tent and help rico and lorrie who were already up in preparing breakfast. we had nothing particularly grand planned for breakfast, just hotdogs, bacon, and tuna and cheese omelet. niel, the unfortunate vegetarian in the group, spent a lot of time looking for a small jar of peanut butter. my story about him turning vegetarian as an exaggeration of his boring self was a hit. he pretty much ignores my jokes, or at least, lets them pass. no one is spared my wit and sarcasm, really. although we finished early, i was last to pack my things, as always. so i was also last to leave the campsite. 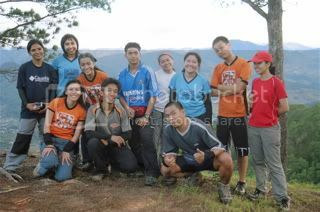 nevertheless, it proved to be our good fortune because the ones who had left ahead after sir oca and kuya mar, got lost. chalk this up to mardel’s record. hehe. good thing i had a signal. TL maida phoned, and instructions were given by kuya mar, and before long, we were trekking along a narrow ridge, with steep cliffs and fantastic views on either side. in a short while, we caught a glance of what seemed like a lonely and steep mound towering above a scattering of houses up ahead. kuya mar said it would be our destination, and we hoped to reach it by 4pm. so we sped off for the village nearby. it was a steep descent that was lovely in every respect. the trek is so much different from what we’ve so far experienced in our TCs, but what the spanish trail lacked in challenge, it more than made up for in enjoyment. at the barangay, we settled at a general merchandise store where we bought all the coke. we also borrowed a huge pan where we prepared beef tapa and ver’s anything goes sinangag. the happy group was about to believe me when i said i loaded the kawali on my topload. silly. pretty soon, these guys will never believe a word i’ll say. after a long, restful, and hearty lunch (did i mention this was a fun climb? 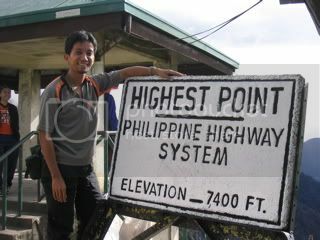 ), we proceeded to our next destination: the summit of ampacao. we passed another barangay of bauko, and along the way, more rice terraces, an ancient bridge, and more views. a slight rain began to fall just as we rested under the eaves of an unfinished school building. at that point, 2 options presented themselves: a shorter trek to the road where there might be a jeepney that could ferry us to sagada, or a trek up the summit which may take anywhere between an hour and a half to two. the team was divided, and only around 4 of us were interested in hiking. so kuya mar picked up his bag and entered what he described as sherwood forest. the trees were thick, although the elevation didn’t allow for much congestion. the foot trail was disappearing underneath a carpet of grass, and there were a few bald trees still standing erect, like the bones of history. finally we reached a peak. a thick mist had descended upon us and i couldn’t find the cellsite that i knew stood there. kuya mar clarified that this is just one of ampacao’s peaks. so we sped to the next one. 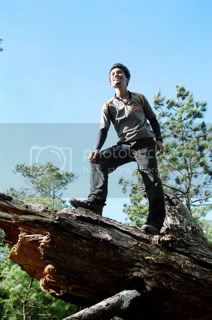 as francis and i were descending to the saddle that connected the twin peaks, i heard a shrill cry, and i wondered out loud if it was a bird. a pig. or a girl. the group behind us verified that it was in fact a raptor, and it flew just above them as they made their own descent. then, as we assaulted another peak, something took shape in the fog. it was tall and erect and empty, like the skeleton of a giant. 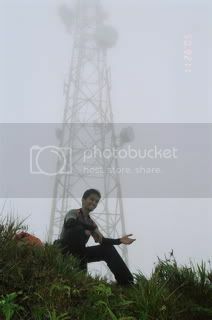 “the tower!” i remarked, and ran the rest of the way only so i could say i was the first on the highest peak in sagada. seeing the tower after only 45 minutes from when we were warned of another 120 minutes was a rather rewarding experience. 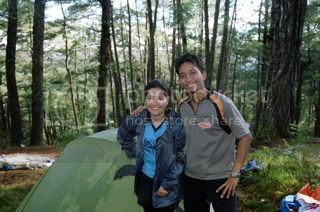 we stayed there a while and pushed for sagada proper after a brief appreciation of our modest achievement. when we started descending, the fog was suddenly lifted, and we could make out the clump of houses up ahead, including the cemetery, the granite walls chewed by rainwater, and even the echo valley where the hanging coffins are found. it was just a brief run to the field below. there was a wide expanse of green. the place was becoming quite familiar. after a few pictures, we ran the rest of the way to the junction going to the caves. there, we decided to pause for a while and await the arrival of our companions. it was actually a ruse. 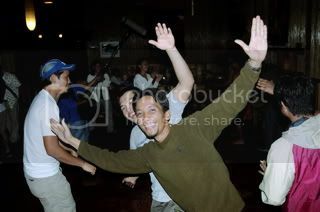 what kuya mar really wanted was to sneak in some beer into his system and sing karaoke for a short while. then it was decided that we just proceed to our place of lodging, which was supposed to be just beside st joseph. we flagged a jeep and were deposited to medina’s bldg shortly. kuya mar, myself, and vince shared a small corner room which commanded a nice view of the small, sleepy, pleasant town of sagada. from here, it is easy to see the growing contrast that’s gnawing at sagada’s fame and charm. there’s some degree of prosperity here, and concrete houses are sprouting like magic mushroom on a huge mound of cow poop. there are dream satellite dishes everywhere. before i could reflect further on the change that’s eating my favorite destination, it was eventually time to take a bath and have dinner. for dinner, i suggested that we have it at yoghurt house. we left early, knowing well that the place is packed at peak hours. i placed orders for the others even while they were still getting ready. niel ordered 3 vegetarian dishes, and thanked me profusely for my recommendations. i discovered some changes in yoghurt house: it now has a well-lit, tiled toilet and even a fireplace. the ceiling is pretty much the same, and the food is still excellent. from there, we proceeded to masferré’s for beer and our post-climb. here, we found our other friends, the ones who opted not to climb. they shared their stories of the cave connection, and as i put my arm over alexis’ shoulder, i kept wondering how he squeezed himself into the crevices and holes that even proved to be small for someone as slim as me. after the round of beers, we ordered half a case from our place of lodging, but ended up going to rock inn and café. the bikers were there, and we proceeded onboard chris’s truck. the chilling sagada evening wind pelted furiously on our faces as we cruised at a hitherto unimaginable speed along the now well-paved highway back to halsema. rock inn is so far removed from the rest of the center, although upon reaching it, i felt i was no longer in spartan sagada. it was rather well-appointed, and spanking new. there was a dap-ayan just outside with a bonfire. we were then called to the dining area where an impromptu dance troupe was about to make a cultural presentation. someone asked that we introduce ourselves and we ended up discovering that we were amongst robin padilla’s people: his daughter queenie (who’s about to start a singing career, so i heard), his cinematographer, his assistant director, his nanny, etc. a stoned joseph introduced us as coming from 1 mountaineering group, and for someone who initially didn’t want to speak, he said quite a mouthful. kuya mar’s introduction was crisp and funny: “i am mar, and i’m an alcoholic,” he said, in almost halting english. he’s such a riot! after the dances, we were pulled into the circle and obliged to do our own dances, following the purposeless movements of the frenzied merrymakers, kicking and lifting our hands while the musicians pounded on the gongs. before the night ended, i was already half-stoned, half-drunk, and completely aware of the crazy things i was doing, but lacking resolve to refuse them. i was so out of control that night that i summoned enough courage to ask the visiting australian ladies if i could have a picture with them. they’re very pretty. we quickly returned to sagada proper. the others were still in st. jo drinking and partying and lighting vegetable, which makes you wonder what the sign “yes to vegetables, no to drugs” along halsema actually means. we kept drinking that night, and i felt i was floating, a little, and saying stuff which i would not normally say if i were more in control of my senses. finally, i got so drunk and sleepy that i decided to just leave and proceed to my room and slept. i laughed myself to sleep as i listened to the funny sounds kuya mar made. i woke up at 6am wondering if the other group proceeded to sumaguing. instead, kuya mar and i just had breakfast at masferré’s. after breakfast i slept again. previously, i had decided to stay in sagada an extra day with rico and lorrie. so after everyone had loaded themselves onto the bus, i sent them off. it was the longest send off since they stayed there more than 30 minutes while i sang and swayed. i think i was entertaining myself more than i was the people who were about to leave. 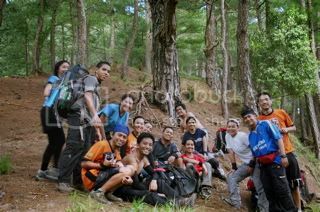 finally they were off and i had time to rest before i left for bangaan with the ones who remained in sagada. initially we walked about a fifth of the way when a jeep came by. going down the stairs was easy, and we not once stopped for a break, although we were able to consume the nice view. we reached the falls in record time. the water poured very powerfully onto the pool below, and although i had been there before, it was like my first time. i wanted to take a dip, but there was this wind which blew from the pool. it was cold and chilling, and i could imagine the x-men’s storm might be standing there commanding the forces of nature to blow us away. so i decided not to take a dip. we hiked back to the road, and although people usually peg the time at 2 hours, it took me, lorrie, and rico only about 45 minutes to get to the road. a jeepney driver was trying to dupe us into hiring his ride for P300, so we just walked until a jeep passed our way. 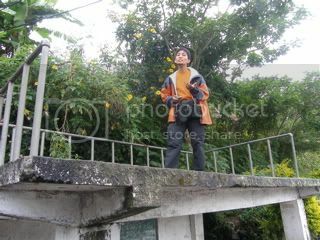 we were in sagada proper in less than 10 minutes, with enough time to visit echo valley, the cemetery, and the church. i acted as guide to both lorrie and rico, and we had time to talk about AMCI stuff. since we had reservations at log cabin, we freshened up and prepared for what promised to be a great meal. my plate alone was enough to feed all three of us. although this wasn’t a buffet, it was nevertheless more than satisfying. i had so much to eat that although i had only around 3 spoonfuls left, i couldn’t get myself to take another one. we retired early that evening and woke up the following day for an 8am trip back to baguio. the trip was uneventful, although it took us 7 hours to reach the bus station despite the better conditions of the highway. 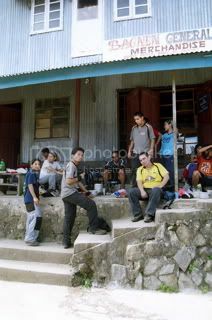 reaching baguio at an odd hour but having had no lunch yet, we looked forward to a mongolian barbecue at o’ mai khan. but it was a disappointment since it ended at 3 and will commence again at 6pm. nevertheless, i had a good seafood meal this time. we passed by the market for some mandatory pasalubong. our bus departed baguio at 6pm, and after 5 hours, we were back in smoggy manila. the thought of having work again depressed me a little, but it is work which allows me to go on these trips: to explore mountains, and to discover secret trails, no matter if we get lost in the process. just because we wander does not always mean we are lost.